UniqueCode: Unique Lookup Code is an alphanumeric string created by the submitter and included with the sample so anonymously submitted samples can be positively identified as the submitter's sample. Marquis: The Marquis Test is a reagent field test conducted by placing a drop of reagent liquid onto a small sample of the material being tested. The chemicals in the reagent react differently with different chemicals, turning a variety of colors based on the what is in the material being tested. Mecke: As with the Marquis Test, The Mecke Test is a reagent field test conducted by placing a drop of liquid reagent onto a sample of the material in question. Mecke reagent is primarily used for the identification of heroin and other opiates. Mandelin: The Mandelin Test is a reagent field test conducted by placing a drop of liquid reagent onto a sample of the material in question. Mandelin is primarily used for the detection of ketamine and PMA. It is a mixture of ammonium metavanadate and concentrated sulfuric acid. 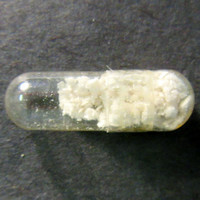 Off-white crystalline powder in capsule. EcstasyData tests ecstasy tablets, powders, research chemicals, new pschoactive substances, and other street drugs through our DEA-licensed laboratory. Ecstasy/Molly tablets cost $40. Recreational drug powder/crystal/blotter costs $100. Pharmaceuticals, supplements and all others cost $150 per analysis. Should the public have access to independent analysis of the products they consume? The vast majority of analyses of over-the-counter, prescription, and recreational drugs are performed in secret with no independent oversite or review. No other historical record, free from politically-controlled agencies, is currently available in North America nor most other parts of the world. EcstasyData, a project of Erowid Center, needs the support of professionals, students, parents, individuals with means, and small foundations for a total yearly budget of around $90,000 USD. Erowid Center's general budget and the co-pays we require fund most of this cost.